Little Big Company welcomes party, wedding or event submissions or sweet cake or dessert features onto the blog, due to the high number of people that visit our blog and large following we prefer fresh and new content that hasn't been featured on any other blogs or websites, excluding your own facebook page or your own blog. This ensures exciting, fresh and new content to the blog. 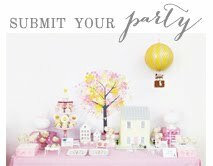 After featuring your party on Little Big Company blog, we would ask a 30 day window where it is exclusively featured on Little Big Company blog, then it can be submitted to other blogs. We also prefer that the submission is not shown on any other blog first as our readers love seeing new content. To ensure that your party looks wonderful on the blog, we like to present it as an online magazine, we prefer no logos, no writing no fonts are placed on the photos. Please email your photos to Louisa@littlebigcompany.com.au entitled "Feature Submission". Please email photos that are no bigger than 700 Pixels each. We love your party submissions to be emailed to us via dropbox which is free http://www.dropbox.com and share it by emailing it Louisa@littlebigcompany.com.au if you have difficulty please just email. Please include a list of your vendors ie cake maker etc and a description of the party. We get an enormous amount of submissions and you will hear within 3 days whether your feature will be featured on The Little Big Company blog. Keep on submitting your parties throughout the year if you haven't heard from us, it means that we may have too many features to showcase at that particular point in time. Terms and Conditions of Submitting your photos, once you email us at The Little Big Company PTY Ltd you are giving your permission for the photographs without limitation to be featured on The Little Big Company Blog, you understand that your photos will be shared on other sites such as Pinterest, Facebook, twitter etc, we do ask people for copyright purposes to link back to our blog so your references and that of your vendors are acknowledged, however in some instances they do not, we try and control this issue. We ask that you are exclusively featured on Little Big Company blog for 30 days after that 30 days your party can be featured on other media avenues (your own blog, facebook and instagram your party can be featured aswell as LBC blog) You also agree not to seek payment from the feature of your submission.You further understand that you release The Little Big Company Pty Ltd from any and all liability associated with the use of your photos and featured submission also you release The Little Big Company Pty Ltd from any liability of copyright if your party feature is shared on third party sites.I hereby consent and grant permission for featuring images that I have sent through to them for public release on The Little Big Company Pty Ltd Blog, by reading this policy online. You further release The Little Big Company Pty Ltd from any claims for remuneration or other compensation associated with any form of damage, whether foreseeable or not, sustained or suffered by the releasing your images (or any other person), associated with the commercial or artistic use of these images. If you send any photos of children in a party you consent that you are the Parent or Legal Guardian of the subject(s) in the photographs, and am over the age of 18 and hereby give my consent to the terms and conditions outlined by The Little Big Company Pty Ltd and the understanding that by sending in my email herein constitutes my agreement to the Terms and Conditions of this featured submission, any other children or guests who are present within the featured needs digital consent by other parents or the guests concerned to you as the postee. You understand that by submitting to The Little Big Company Pty Ltd Blog by emailing us your photos you represent, warrant and agree that no materials of any kind submitted through your feature submission will violate or infringe upon the rights of any third party, including copyright, trademark, privacy etc. The Little Big Company Pty Ltd bears nor takes on any responsibilty for any consequence of your photos being submitted to the blog.I or my legal representative (which could include a legal guardian or person with power of attorney) Acknowledge that I have read the contents and been given in these terms and conditions by The Little Big Company Pty Ltd Blog. Acknowledge that I am over 18 years of age (for children under 18 years a parent or guardian must acknowledge this by emal; Consent to the use of the photographs/images that you have provided to the blog via email to The Little Big Company Pty Ltd. Understand that once any of the images referred to above have been published, The Little Big Company Pty Ltd has no control over the subsequent use and disclosure of the images; Understand that I will receive no payment from the The Little Big Company Pty Ltd or any Directors or any employees of The Little Big Company for the use of my images/photos featured on The Little Big Company Blog. You understand by us posting your featured submission that this will be released publicly, by accessing and emailing The Little Big Company Pty blog at the email given you understand that you have agreed to the terms and conditions and release The Little Big Company Pty Ltd from any forms of damage, whether foreseeable or not, sustained or suffered by the releasing your images (or any other person), associated with the commercial or artistic use of these images. 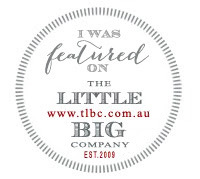 Being featured on The Little Big Company Blog means you agree to completely idemnify The Little Big Company Pty Ltd and The Little Big Company Blog known as http://www.littlebigco.blogspot.com and The Little Big Company Directors, employees and agents against claims, closts, expenses, judgements, damages and any other liability that the material featured on the blog and or provided by in a submission does not contravene any law whatsoever and complete responsbility remains with the person or persons who have had their work or party featured on Little Big Company Blog. No liability will be accepted by The Little Big Company Pty for incorrect information or failure to appear. In the case of any dispute The Little Big Company's decision is final and binding on all parties. The Little Big Company likes to protect your privacy but not publishing your last name, not referring to your address or giving away personal information. Copyright Please note if you like the features on our blog please link back to the post.